It was fun to feel Abraham's enthusiasm for the benefit that their new Meditation CD offers for so many of us. Take a look at this clip, "The Big One," from our Austin workshop (two days before book launch) and you'll see what we mean. Not only will you feel Abraham's pleasure about the benefit you'll get from this Meditation experience, but they explained in a way so great that we ALL understood, like never before, the process of effective affirmations. Why sometimes affirmations work and sometimes they don't. Really, really, good stuff here! 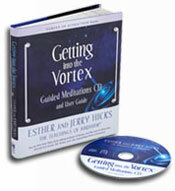 AND, there's a wonderful sample segment from the actual Meditation CD that you'll hear at the end of the video clip.